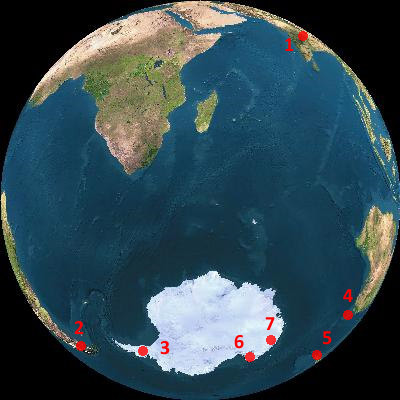 Access to Antarctica is either via ports in the south of Australia and New Zealand or via the tip of South America, Tierra del Fuego. India is closer to Australia and New Zealand than it is to South America, however it costs less overall to visit Antarctica via South America than it does via Australia/New Zealand. Flights from India to Hobart, Australia or Invercargill, New Zealand to visit Eastern Antarctica are about 1/2 to 2/3rds of the cost of those to Ushuaia at the tip of South America to visit the Peninsula region. There are many more trips that visit the Peninsula however with greater variety of itinerary, ships and duration. It is also possible to fly from South America to join a cruise ship in Antarctica. The journey to Eastern Antarctica is by ship only, it is not possible for tourists to fly to that side of Antarctica and a longer part of the journey will be spent at sea than when journeying to the Peninsula. 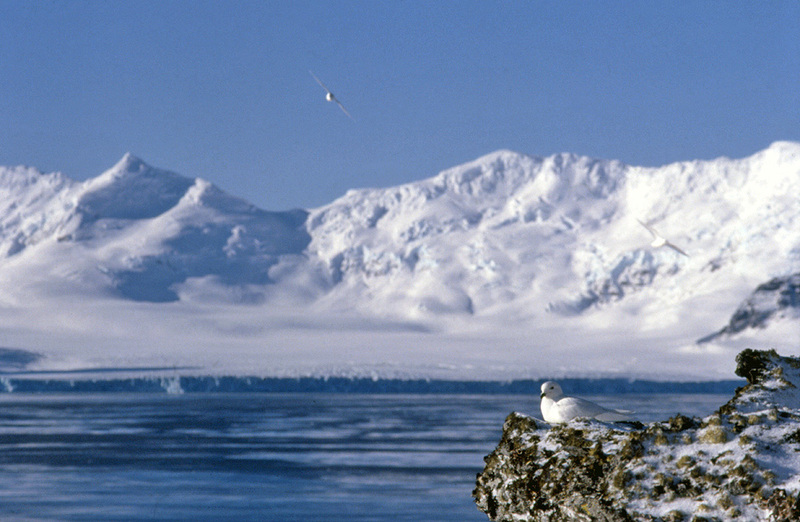 The majority of trips that leave for Antarctica are ship based cruises or fly-cruise trips leaving from the Argentinean port of Ushuaia or Punta Arenas in Chile, flights also leave from Punta Arenas. 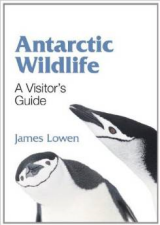 These trips visit the Antarctic Peninsula and nearby islands of the (mainly underwater) Scotia Arc (fig 2) and comprise . 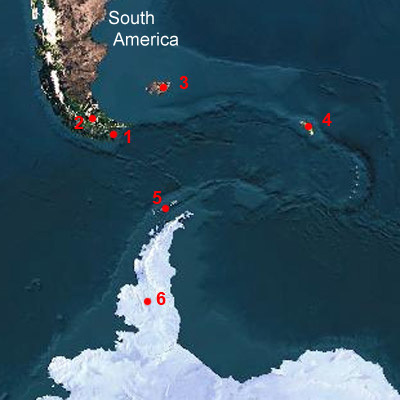 This starts at the tip of South America reaching east from Tierra del Fuego across to South Georgia, down to the South Shetland Islands and then to the west through the South Orkney Islands and finally down to the north extremity of the Antarctic Peninsula. Peninsula trips typically take 10-12 days with 6-16 day trips available, peninsula and associated area cruises are from 15-24 days. There are a smaller number of cruises that depart from Australia or New Zealand visiting the opposite side to Eastern Antarctica. These trips are longer and therefore more expensive with a sailing time of 6-7 days there and the same back again in a total trip duration of 26-30 days. They usually leave from Hobart, Australia or Invercargill, New Zealand, frequently leaving from one and returning to the other. Antarctica is a relatively expensive to visit niche destination, voyages are educational and focus the wilderness and aesthetic experience. A coast-line rich in wildlife backed by snow covered mountains and glaciers with an extreme climate make this a truly magical place to visit unlike any other on the planet. Its remoteness and experiences make it the ultimate destination for many adventurous travellers. Fig 2. 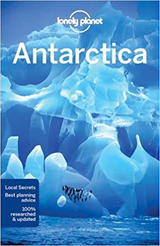 Trips to the Antarctic Peninsula. The majority of tourist trips visit the Peninsula 6 and nearby islands such as the South Shetlands 5. Longer trips may also take in the Falkland Islands 3 and / or the especially wildlife rich South Georgia 4. Ships almost always cruise along the western side of the Peninsula, the eastern side and Weddell Sea frequently has much heavier potentially problematic sea ice. Fig 3. Trips to the more remote and less visited Eastern side of Antarctica almost always depart from Australia or New Zealand, Hobart, Australia 1, Invercargill / Port of Bluff in New Zealand 2, Invercargill has the airport, Bluff, 30km away by road has a deep-water port. Less commonly trips may leave/return from or other ports in New Zealand such as Dunedin or Lyttleton. Trips may depart and return to the same port though often leave from one and return to another in either direction. 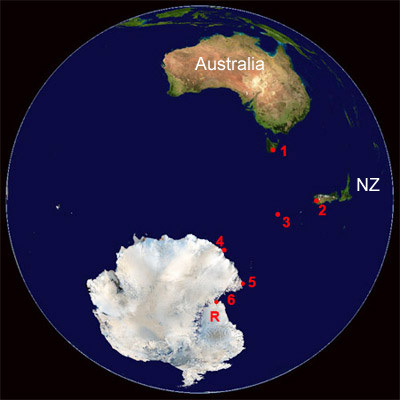 There are about seven days sailing to reach Antarctica, the journey there and back is broken up with visits to the wildlife rich Macquarie Island 3 and other island groups such as Snares, Auckland and Campbell that lie between Macquarie and New Zealand.